The Uromastyx, or Spiny-tailed lizard, are mainly found in India, the Middle East including Egypt and North Africa. The average adult uromastyx measures 10" in length, although some species can be as large as 36" long. Shy and reclusive, the uromastyx has often been considered a hands-off pet, as they stress easily, but they can be tamed with patience. Hand-feeding a treat, such as a superworm, will aid in the taming process. Uromastyx are basking lizards of the agamid family and require a very hot basking surface temperature of between 110-120*F. Clear infrared heat lights are a new idea in uromastyx keeping because the heat penetrates deeper than the skin and into the muscles and gives them the heat intensity that they require. A regular reptile basking light with a reflector built in can also be used. The basking light should be over a flat paver or piece of slate to provide the needed belly heat. The ambient temperature on the hot side of the tank should be 90-95*F and the cool side between 80-85*F. Measure the basking surface temp with a reliable temperature gun or digital sensor/probe thermometer. Uros do well with a 13 hour day and 11 hour night schedule, and night time temperatures should not go below 68*F. A ceramic heat emitter should be used to keep ambient night temperatures at least 70*F. Multiple uromastyx housed in the same enclosure should have separate basking spots to allow for ample basking space and time for each uro. Provide low hides on the cool side of the enclosure for your uro to sleep and escape from the mid-day heat if needed. The hide should be low enough for the uro to feel his back up against the roof to feel secure. In the wild, the spiny-tailed lizard will sleep with his tail facing the entrance of the hide for added protection, as their tail is rough and muscular. The preferred substrate for the uromastyx is white millet, as it is low in dust and they can snack on it, which adds roughage to their diet. Their poop, which is like dry pellets, can be easily removed from the millet, and the substrate will last for several months before needing to be changed. Crushed walnut shell substrate should be strictly avoided, as the sharp edges that are created in the crushing process can perforate their intestines and lacerate the stomach, as found in necropsies of uromastyx housed on walnut shell. Calci-sand and other sand substrates should also not be used with the uromastyx, as the fine particles are an eye irritant and they cause too much dust when the uros dig. 1/4" of while millet substrate is an adequate amount for them to dig in. Hatchling uromastyx under 4" should not be kept on loose substrate, and instead should be kept on reptile carpet or a bare enclosure. 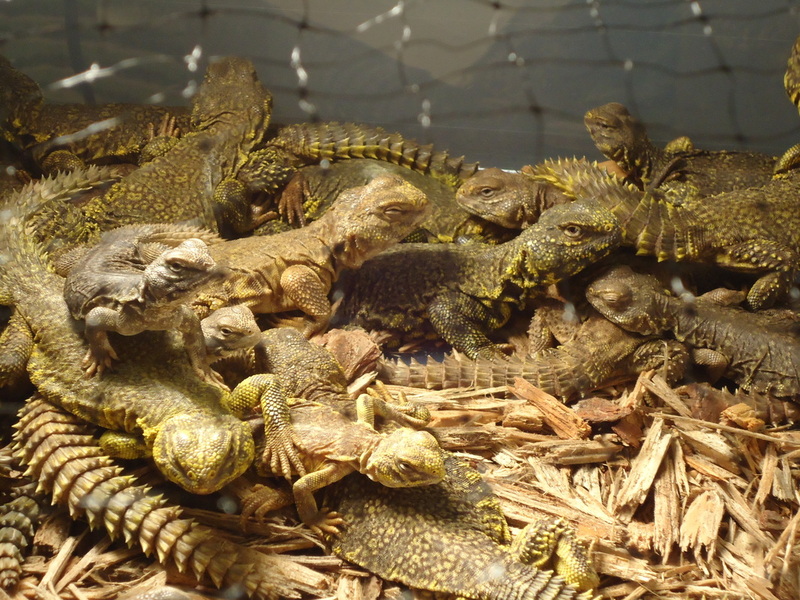 Hatchling and juvenile uromastyx can be housed in a 20 gallon long enclosure, but the minimum enclosure size for adults is 30 to 40 gallon breeders or a 4x2x2. 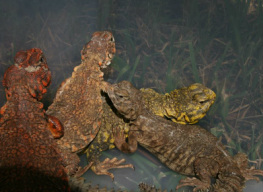 Multiple uromastyx can be housed in the same enclosure, however there can be injury and fighting with two males housed together. Also, a gravid female may display aggression towards another female. Since uros are active creatures, the larger sized enclosures are preferred. Natural sunlight is extremely beneficial to the uromastyx. 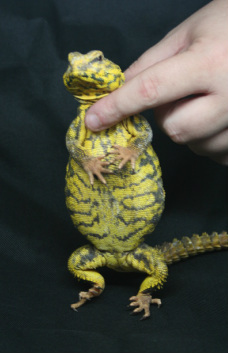 Improperly housed uromastyx. Photo taken at a reptile expo. The woodchip substrate in this picture is not ideal for the uro and they should instead have white millet or birdseed with the larger seeds removed. Also there are too many uro in this enclosure. Uromastyx are largely herbivores and should rarely be fed insects. The phosphorus in most feeder insects causes metabolic problems in the captive uro. If you wish to feed insects to your uromastyx, serve them as an occasional treat, giving only a few superworms or crickets per week. Their diet should consist of fresh leafy greens, such as spring greens mixed with turnip or collard greens, dandelion greens, boc choy, clover, hibiscus and rose of sharon blooms, cactus pad and grated squash. Weekly feedings of a mix of frozen peas, carrots and cut green beans can also be given, and provides variety in their diets. Dust their greens with calcium plus D3 five days a week, and a mineral supplement, such as Miner-all, two days a week. The subject of UVB has been recently disputed between keepers and reputable breeders, and there are conflicting opinions as to its benefit. A low-quality compact/coil UVB is considered useless to the uro and has been attributed to eye problems, and for this reason many keepers do not use UVB. There are linear tube UVBs such as the ReptiSUN or Arcadia that have been found to have a consistent and safe level of UVB and have not been reported to cause eye problems. The Mercury Vapor UV bulbs have not been recommended for uros as the UV can be inconsistent and too strong, and can cause skin and eye irritation. We encourage you to do your own research and have provided the below links to professional opinions on the UVB issue, as well as forum discussions. For information about UVB and the reason reptiles require UVB lighting, please see our Understanding Lighting page. Forum thread discussing the opinions regarding the need for UVB. Reputable uromastyx and exotics breeder, Deer Fern Farms, care sheet with UVB opinion.